One of the newest forms of video poker is a game called Multistrike Poker. It's a video poker game with a twist. 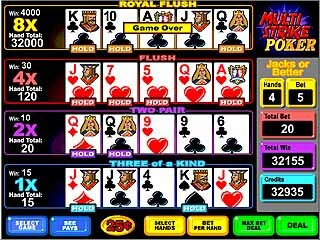 In the following article, you will be able to learn the rules for Multistrike Poker, understand how to play this new game, see what this game looks like and be presented with some strategy information that can help you win at Multi-Strike Video Poker. Sadly, Multi-Strike video poker is a game that is not available online. The nearest that the online casinos have to offer is their multi hand online video poker options where you can play up to 100 simultaneous hands of video poker. 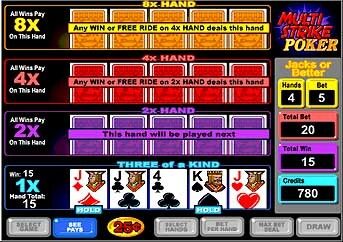 Multistrike Poker is a new multi-hand video poker game with a unique twist that is unlike any other video poker game out there. Multistrike poker is a four handed game, which costs 20 coins at the maximum betting level of 5 coins per hand. Your hands are played one at a time, starting with the bottom hand. Multistrike Poker is generally played as a standard Jacks-or-Better game. The twist is that in order to be eligible play the next highest hand shown on the screen below, you MUST WIN your initial hand and in order to advance you must continue to win each current hand. An added feature is that, as you progress from the bottom to the top hand, each successive hand pays double the previous hand. For example, in the sample screen shown below, the player has wagered five coins and was dealt a winning combination of three Jacks on their initial poker hand. Just as in standard Jacks or Better payout structure, this hand was awarded fifteen coins. The bottom, or initial, hand is paid exactly as it would have been had this been a standard single hand Jacks-or-Better video poker machine. Since this is Multi-Strike Poker, however, any winning combination is multiplied by the multiplier shown to the left of each hand. The first, or bottom, hand is simply multiplied by one. Now, since the first hand resulted in a win, this player is eligible to play the next hand. Notice that the multiplier to the left of this hand is 2X. This means that if the player makes a winning poker hand now, the payoff will be multiplied two times. If the player wins on this second hand, he will have the opportunity to play the next hand, for which all winning combinations are paid off at FOUR TIMES (4X) their normal payout amount. Continuing on, the player has advanced through all four hands (as seen below) and was fortunate enough to make a Royal Flush on the top and highest-paying hand. Normally, a Royal would pay 4000 coins, but since this is Multi-Strike Poker, this lucky player was warded 8 x 4000 or 32,000 coins for completing a Royal on the top hand, as well as all of the smaller payoffs as well. There is one additional way to advance to the next highest hand and this is by getting a special card called a Free Ride card, which automatically advances the player to the next hand. It is important to realize that some strategy changes are necessary to ensure that you play Multistrike Poker using the optimal strategy. Firstly, it is important to note that it is of utmost importance to win each hand as that is the only way you can move up to the next and more lucrative hand. The way this changes the typical Jacks-or-Better Strategy is that you make no longer draw to certain long shot hands, with the exception of the last hand that is played exactly according to standard Jacks-or-Better video poker strategy. For example, let's say you have reached the third, or 4x, hand and are dealt a low 3-card straight flush and two high cards, but in order to draw to this hand, you must discard two high cards, both Jack or higher. Normally, you would make this play, however, since in Multi-Strike Video Poker it is SO IMPORTANT to reach the next hand, you would now discard your low three card straight flush in favor of holding the two high cards with the hope that you would at least match one or the other for a winning Jacks or Better hand, which will then allow you to progress to the top 8X hand. We hope you enjoyed this video poker lesson. Always remember that when playing Multi-Strike Poker it is important to reach that next hand-so important in fact that sometimes you should be willing to give up some equity when making your hold/draw decisions for your current hand.